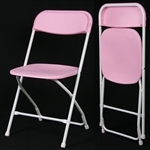 Wholesale Prices Plastic Folding Chairs. Our Plastic Folding Chairs Chosen by the U.S. Military, Churches, Rental Firms, Hotels and Schools. SGS Tested 800 lb Capacity. Guaranteed Lowest Prices for Folding Chairs since 2001 - FINANCING NO PAYMENTS FOR 90 DAYS- PRICES INCLUDE 8% TARIFF IMPOSED BY THE PRESIDENT. Factory Direct Folding Chairs have a static weight capacity of 800 lbs and a moving weight capacity of 350 lbs. We offer White, Black, Fruitwood, Mahogany Resin Folding Chairs. Each Wholesale Folding Chair colors work well with any décor. All our Wood Folding Chairs come with a replaceable Vinyl Comfort Cushion and a Five Year Warranty. If there is an issue during the 5 Year Term, we will replace your Wood Folding Chairs Free of Charge. Call our customer service department with any questions on our Wholesale Wedding Folding Chairs.